Rolex President Datejust Ladies 18K Yellow Gold Factory Champagne Diamond Dial 26MM Watch 69178 (Certified Pre-owned) | What Should I Say? 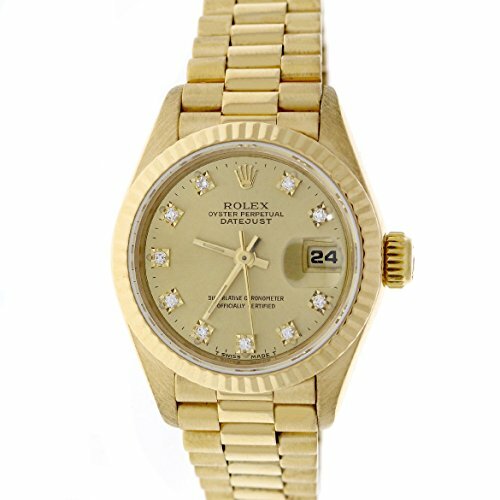 Rolex President Datejust Ladies 18K Yellow Gold Factory Champagne Diamond Dial 26MM Watch 69178 (Certified Pre-owned) by Rolex at What Should I Say?. MPN: A1UP-S87977DATEJUST-HV-CPO. Hurry! Limited time offer. Offer valid only while supplies last. Rolex President Datejust Ladies 18K Yellow Gold Automatic Watch, 69178. Self-winding Rolex automatic movement. 18K yellow gold case 26mm in diameter. Rolex President Datejust Ladies 18K Yellow Gold Automatic Watch, 69178. Self-winding Rolex automatic movement. 18K yellow gold case 26mm in diameter. Screw-down crown. Scratch-resistant sapphire crystal. Rolex factory champagne dial with diamond hour markers. Rolex 18K yellow gold fluted bezel. Date calendar window at 3 o'clock position. Functions: hours, minutes, seconds, and date. Rolex 18K yellow gold President bracelet. Excellent, pristine condition, works flawlessly, comes with Rolex box, factory instruction booklets, Rolex hangtag, and ElegantSwiss one year warranty. The watch is running strong and keeping accurate time, having been timed to precision on Witschi Expert Timing Machine. Stock# ES24323061. Buy with confidence knowing each timepiece goes through the same rigorous 31-point inspection. Rest assured only authentic parts straight from the manufacturer are used. The Certified Pre-Owned Program on Amazon ensures peace of mind and transparency via standardized reports and a 1 Year Warranty Provided by WatchFacts. View More In Certified Pre-Owned. If you have any questions about this product by Rolex, contact us by completing and submitting the form below. If you are looking for a specif part number, please include it with your message.